Electronic Dance Music, like all of the popular and overpopulated genres of the world, is a fickle lover. As a singer at the height of your career, your voice caresses the minds of millions of listeners through collaborations with producers. At the lowest point, you are forgotten, another echoed voice over a dance beat. But Mexican-American singer- songwriter, and yogi from New York City, Liah Alonso is so much more than an EDM singer, she is a fully fledged multi-genre artist. Furthermore, rather than aiming for the heights, she is aiming to be the best possible artist she can be, EDM or otherwise. And if her dance-flavored single, remixed by DJ Taz Rashid is any indication, Liah’s presence will be long-lasting. Liah Alonso and DJ Taz Rashid met years ago at a mindful meditation dance party in Miami and then shared the stage last year for the first time at WANDERLUST Yoga and Music Festival in Mexico City. 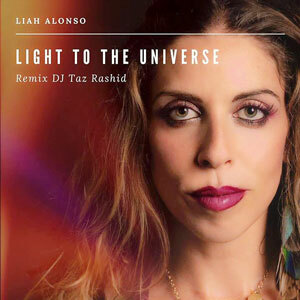 March 1st 2019 saw the release of their collaborative single – “Light To The Universe: Remix” – written and performed by Liah, and remixed by DJ Taz Rashid. The song is described as a musical prayer for love, light and peace to the universe. This is a very atmospheric track, aiming to engage the senses rather than lay siege on them. So Liah’s voice is the star, as it has and always will be. The worldly melody and airy beat driven by a strumming acoustic guitar seems to be a far cry from the sweaty, euphoric EDM arena anthems. Yet it’s but a stone’s throw away from the center of the dance floor, thanks to DJ Taz Rashid’s timely synths and persuasive percussion. “Light To The Universe: Remix” blows away all expectations of what a remixed Liah Alonso track could sound like, both thrilling and intense. It’s this aspect of the song that turns your perceptions on their head. 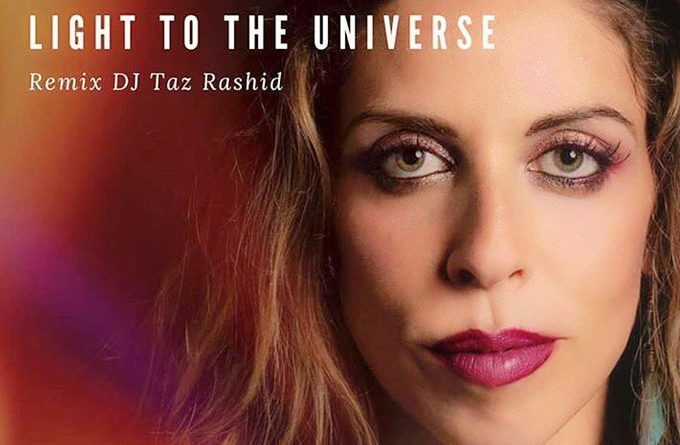 As good as the original track may be, DJ Taz Rashid opens new possibilities. Liah Alonso’s vocals alongside DJ Taz Rashid’s uplifting remix creates a driving but eloquent soundscape fans of both artists will surely adore. As human beings, we are all searching for that one thing that will release our positive energy, a type of energy that speaks to us from a place that we simply can’t describe in words. A spiritual awakening of the soul, driven by a glorious melody and driving beat. Filled to the brim with excellent songwriting, “Light To The Universe: Remix” offers a state of pure bliss and unbridled happiness. The song intuitively finds its equilibrium between Liah’s resolute vocals and heart-on-sleeve lyrics and the diffused acoustic guitar and more vertically inclined synths. Immediately you are drawn in, with a melody that prepares you for the anticipated build of energy that you know awaits you right around the corner, setting you adrift on a sea of chill vibes with a peaceful harmony. Throughout, Liah Alonso’s proves herself as one contemporary artistic powerhouse. MORE ABOUT: Liah Alonso is a Mexican-American singer- songwriter and yogi from New York City. Her music combines political activism with personal storytelling in cleverly crafted and catchy pop songs. Since her early years as a professional busker in the NYC subways, through a 5-year run with folk-rock duo Left On Red, to her current solo performances, Liah has performed in notable venues throughout the USA, Mexico and South America. Most recently Liah has been invited to share her songs among the supercharged political climate of New York City’s resistance movement, offering a joyful vehicle for people to participate and express themselves in a peaceful manner. The Gary Douglas Band: “Million Miles Away” – a sense of purpose!